Double the deliciousness of lunchtime with the Wildkin Double Decker Lunch Box. Insulated and non-toxic, this two-tiered lunch box keeps meals fresh. On top, a roomy pouch is great for chips, fruit and drinks. The lower level includes a storage container*, and is a great place to store the main event. Includes handy shoulder strap for easy carrying. The Double Decker lunch box is expertly designed for any lunchtime adventure. L: 8in. x H: 8.5in. x W: 5.75in. One-year manufacturer's warranty against defects - normal wear-and-tear, and misuse excluded. 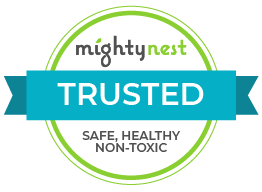 Rigorously tested to ensure that all parts are lead-safe, BPA-free, phthalate-free, and conform to all rules and regulations set forth by the Consumer Products Assoc. * Please Note: this lunch bag comes with a BPA-free polypropylene (#5) plastic storage container. Although this container is made out of food-safe materials we feel glass, stainless steel and silicone are the safest options for food storage. So while the container is included from the manufacturer you might choose to use the box for some other type of non-food storage. I LOVE this! My daughter had one last year for Kindergarten. It allowed me to put her snack, lunch and water bottle in it because of the space! I'm now getting one for my son this year (Kinder). It's very roomy and sturdy.